A leading public intellectual, Rev. Sekou is releasing 5 books with Chalice Press—a publisher of progressive religious thought. Chalice Press is republishing Rev. Sekou’s “Urbansouls: Meditations on Youth, Hip Hop, and Religion” and “Gods, Gays, and Guns: Essays on Religion and the Future of Democracy”. His new titles are “The Task of the Artist in the Time of Monsters”; “This Ain’t Yo’ Daddy’s Civil Rights Movement: Ferguson, Black Lives Matter and the Legacy of Martin Luther King, Jr”; and “A Liberation Theology of Ferguson”; He has written widely on the 2011 killing of Mark Duggan by British police and the subsequent London riots, and is the author of the forthcoming “Riot Music: Race, Hip Hop and the Meaning of the London Riots 2011” (Hamilton Books). His documentary short film, Exiles in the Promised Land is based on his visit to a refugee camp and lecture in Beirut, Lebanon. It was selected for the Amnesty International Human Rights Film Festival (2009). Having studied continental philosophy at the New School, systematic theology at Union Theological Seminary, and religion at Harvard University, Rev. Sekou has lectured widely, including at Princeton University, Harvard Divinity School, the University of Virginia, University of Paris IV – La Sorbonne, and Vanderbilt University, and is a former Professor of Preaching in the Graduate Theological Urban Studies Program at the Seminary Consortium of Urban Pastoral Education, Chicago, IL. Rev. Sekou was selected by Ebony Magazine’s Power 100, NAACP History Makers (2015), and on the Yerba Buena Center for the Arts 100 –list of creative thinkers. He received the Keeper of the Flame Award from the National Voting Rights Institute and Museum in Selma, AL, and was appointed a Associate Fellow at the Institute of Policy Studies. Reverend Sekou served as Pastor for Formation and Justice at First Baptist Church in Jamaica Plain, Boston. He was formerly Senior Pastor of Lemuel Haynes Congregational Church in Queens, served as Special Assistant on Social Justice to the Bishop for the Church of God in Christ, Senior Community Minister at New York’s Judson Memorial Church, and Social Justice Minister at Middle Collegiate Church, New York. He has been Fellow-in-Residence at the Brooklyn Society for Ethical Culture, and as Ella Baker Fellow at New York Theological Seminary’s Micah Institute, he served as a strategist organizing clergy for economic justice in New York City. Reverend Sekou was a delegate to the World People’s Conference on Climate Change and the Rights of Mother Earth in Cochabamba, Bolivia in 2010. was a member of the inaugural Dorothy Cotton Institute Palestinian/Israeli Non-Violence Project’s delegation of US Civil Rights leaders to the West Bank in 2012. Reverend Sekou served as Editor as Chief of Spare Change News, the nation’s oldest continuous street newspaper, from 2012-2013. Rev. Sekou co-led an interfaith delegation to Haiti one month after the tragic earthquake. He built toilets alongside the Haitian people. Based on a Lecture he delivered in Beirut, Lebanon, his short documentary film, Exiles in the Promised Land: The Quest for Home focuses on the plights of Palestinians, Iraqi, and post-Katrina New Orleans. The film was accepted at the Amnesty International Human Rights Art Festival. Rev. Sekou was a delegate to the People’s World Climate Change Conference in Bolivia. He was a delegate to the Interdependence Day Conferences in Istanbul, Turkey and Berlin, Germany. Rev. Sekou has released two critically acclaimed albums “The Revolution Has Come” (Farfatched, January 2016) and “In Times Like These” (Zent Records, May 2017). Released with Rev. 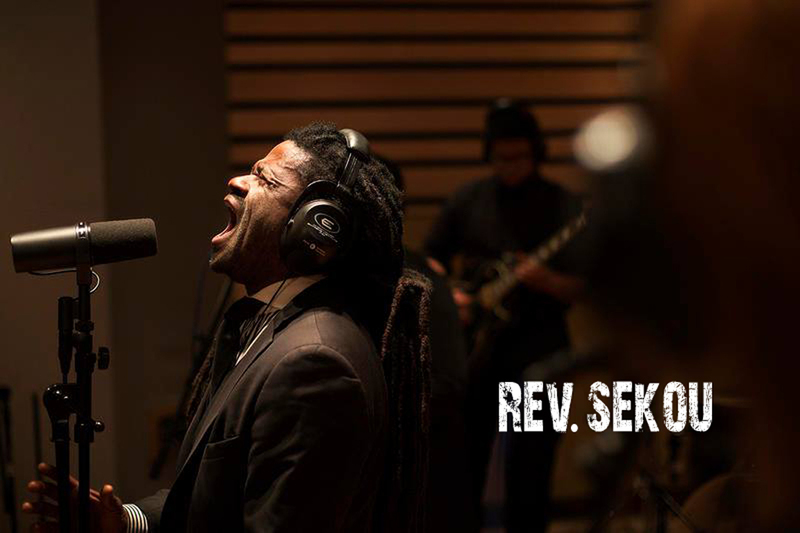 Sekou and the Holy Ghost, “The Revolution Has Come” is 9-track project celebrates the gutbucket blues, gospel, soul, and funk at once.AFROPUNK celebrates the album’s ”deep bone-marrow-level conviction”. The single, “We Comin’”-was named the new anthem for the modern Civil Rights movement by the St. Louis Post-Dispatch. Harmonica, rock guitar, and a B3 Hammond organ carry the listener to protest ecstasy. In Times Like These, is Rev. Sekou debut solo album. Produced by six-time Grammy nominated Luther Dickinson of the North Mississippi Allstars, Rev. Sekou’s debut solo album is a new vision for what Southern blues can mean today–—all saturated with Pentecostal sacred steel and soul legacy. “In Times Like These” is drenched with the sweat and tears of the Mississippi River, the great tributary that ties so much of the South together. The sonic landscape of Rev. Sekou’s music captures the toil of Southern field hands, the guttural cry of chain gangs, the vibrancy of contemporary street protest, backwoods juke joints, and shotgun churches. Rev. Sekou tours with the Brooklyn-based—The Seal Breakers– a twelve piece ensemble that includes four horns, two backup singers and a Hammond B3 organ. Their concerts invoke the spirit of the southern Tent Revival where all are welcome regardless of race, gender, or sexual orientation. This Ain’t Your Daddy’s Civil Rights Movement: Black Lives Matter and the Legacy of Martin Luther King, Jr.
From the fine arts museums to foot stomping juke joints, artist have long played a key role in the movement for social justice. Critically acclaimed musician and activist, Rev. Sekou believes that artist will play a critical role in healing the acrimony that beset much of our national dialogue. Rev. Sekou’s own music builds upon movement music by the SNCC Freedom Singers, The Staple Singers, and the blues tradition. By accessing the life work of cultural genius such Albert Camus, James Baldwin, Audre Lorde, and Rosetta Tharpe, Rev. Sekou unearths the ways in which artists have provided the balm for wounded social justice warriors. The recent election has revigorated the cultural wars. With over vast majority of white evangelicals supporting President Trump and the roll back civl rights victories, religion will continue to play key role in our public life. This talk, based on Rev. Sekou’s book Gods, Gays, and Guns, explores the topics of gay marriage, economic justice, and social movements, taking audiences on a spiritual journey that highlights our current crisis of faith—in both religion and democracy. At the heart of this speech is the provocative claim that democracy and God have failed. With unflinching candor, Rev. Sekou will challenge audiences to rethink the meaning of the role of religion in our global democracy. Trained at the Highland Center and tutored by Rev. Dr. James Lawson—who Martin Luther King called the greatest nonviolent theorist in the world– Rev. Sekou has trained thousands in the tradtion of nonviolent resistance throughout the United States. He is considered one of the leading figures in nonviolent civil resistance. Actions he has led have been covered by the New York Times, Washington Post, and USA Today. These workshop style trainings give organizers understanding of the moral philosophy of militant nonviolent civil disobedience, the real time tactics, and the infrastructure necessary to support movement leaders who risk arrest.